Christmas has really crept up on me this year! I am so ill prepared for this year’s festivities. I’ve barely bought any presents, the house doesn’t feel Christmassy at all – I don’t think you can count a bag of clementines and some chestnuts as Christmas decorations. I will get all of the shopping, wrapping and decorating done, we generally don’t have a big tree or go crazy with decorations. I’m also really bad at remembering to send Christmas cards, I haven’t even bought any yet and I’m aware that the last Christmas posting dates are getting close! You might be fooled into thinking that I don’t like Christmas, but that’s not the case I really enjoy it. Houses have twinkling lights, there are decorated trees everywhere people are generally in a lighter mood and it’s considered acceptable to ingest and imbibe far too much and you get extended time off work and lie-ins! My first Christmas themed post this year is a raspberry and white chocolate kugelhopf. 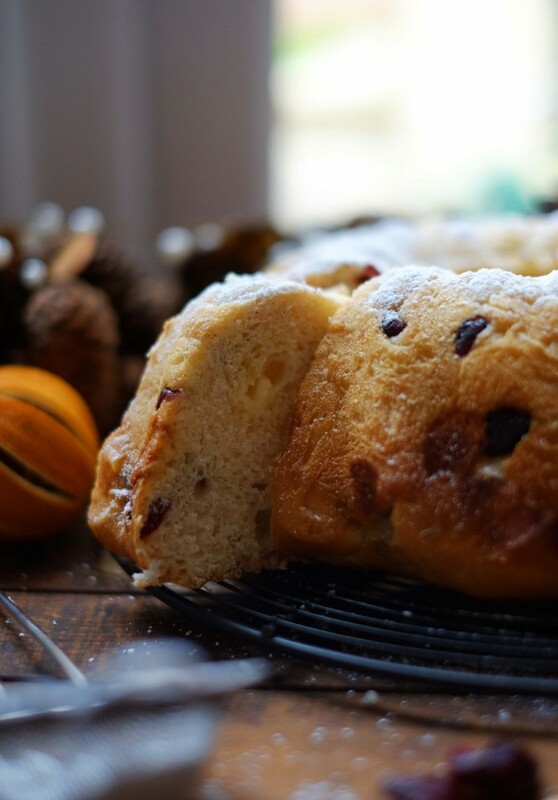 This isn’t traditionally a Christmas bake, but as a sweet bread it tastes a lot like panettone or even stollen (minus the marzipan). The cranberries really help to make it feel more festive and combined with the amazing Valrhona white chocolate I got for my birthday (yes I’ve managed to leave a bar of chocolate untouched for 8 weeks+) from Sous Chef, it’s a real sweet treat. As I’ve mentioned this is a sweet bread, rather than a cake so you do have to wait for this to prove. This isn’t a time consuming recipe, but you need to be around the house a bit to wait for it. I did pop out to run errands in between the proving though. This was a style of bread making I hadn’t done before, a starter is covered with flour and left to rise before the ingredients are all added. The dough is then proved, shaped and left to prove again. 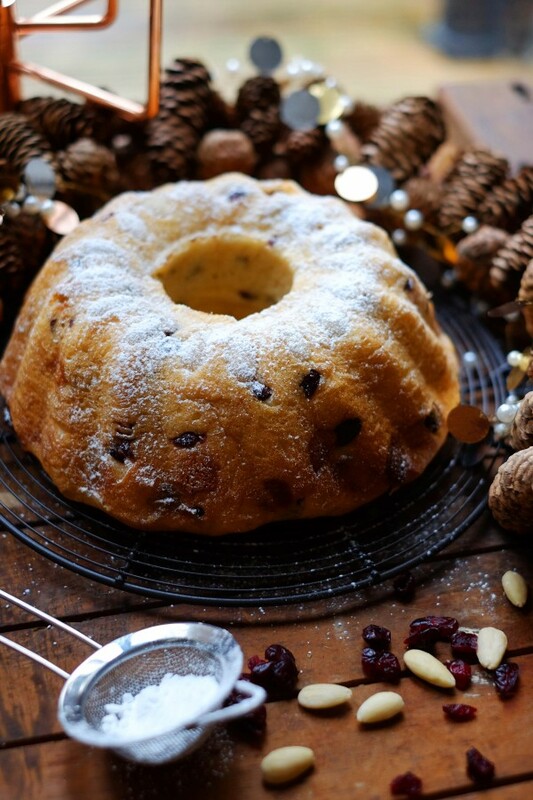 The kugelhopf is then baked for 25 minutes, it doesn’t need very long at all, which means the chunks of chopped white chocolate don’t really melt, so you get a lovely burst of sweetness. If you find after a couple of days the kugelhopf is getting a bit dry, you can warm it in the oven or microwave and dust it with more icing sugar. It tastes really great warm too. This cake isn't traditionally served at Christmas, but it reminds me of a lighter more moist panettone. The addition of cranberries makes this feel very festive. Put the cranberries and chambord in a bowl together and soak for a few hours or overnight. Put the yeast into the bowl of a stand mixer, add 50g of the flour and stir until a firm ball of dough forms. Cover this starter with the remaining flour and leave to rise in a warm place until the starter has risen underneath and you see the flour start to crack, this should take around 30 minutes. When the starter is ready, add the egg, milk, sugar, salt and butter to the bowl, knead the dough on a low speed for 7-8 minutes, increase the speed to high until the dough is elastic and pulls away from the side of the bowl, this should take 2-3 minutes. 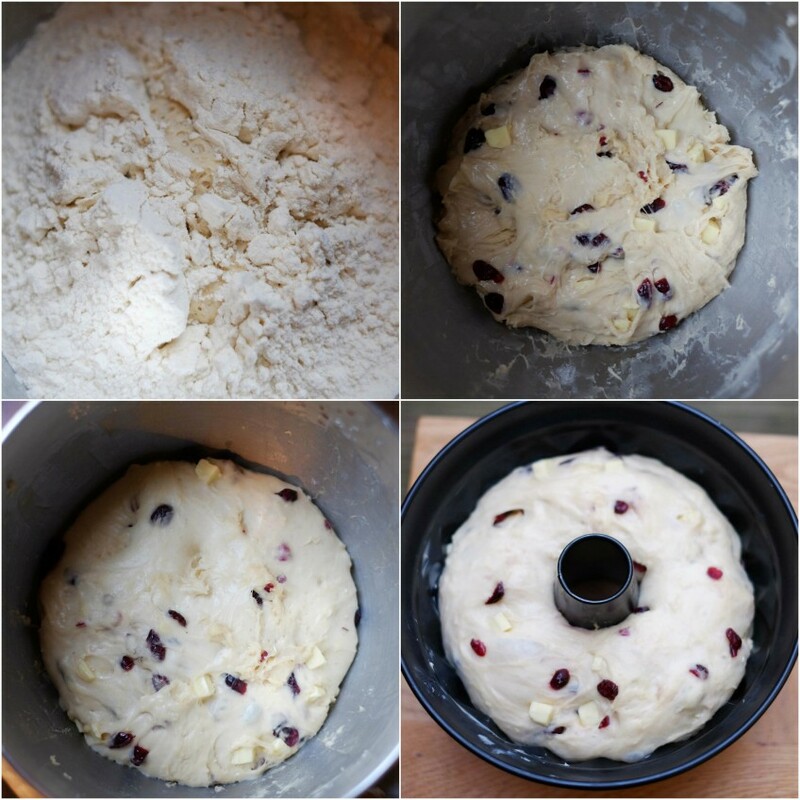 Drain the cranberries and add them to the dough along with the white chocolate, knead the dough further to mix in the cranberries and white chocolate. Let the dough rise in a warm place until doubled in size, around 2 hours. Grease the kugelhopf tin with butter and place an almond in each of the indentations in the bottom of the tin. With lightly floured hands, shape the dough into a sausage and wrap it around the hole in the kugelhopf tin. Leave it in a warm place to rise again, until the tin is filled, about 2 hours. Preheat the oven to 170C Fan and bake for around 20-25 mins, until a cocktail stick or cake tester comes out clean. 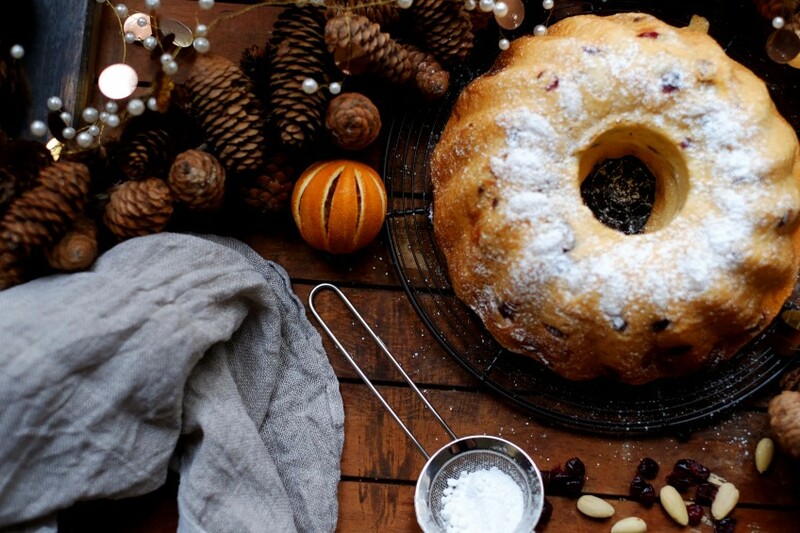 Turn the kugelhopf out onto a cake rack and dust with icing sugar while it's still warm. Keep an eye out for some more festive recipes from me, I’ll have something savoury coming up and some great food gift ideas. I’ve added this to Fabulous Foodie Fridays and Recipe of The Week. 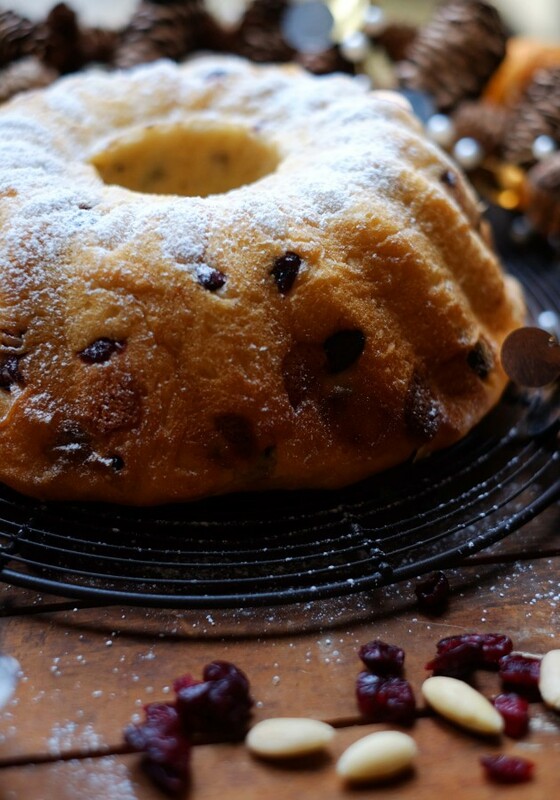 I adore sweet bread/cakes, unfortunately I find them incredibly addictive and usually end up eating the whole thing myself… I haven’t made a kugelhopf before though as I don’t have a tin; yours looks beautiful and boozy cranberries and white chocolate sound like a fantastic combo. It’s also not a bread making method I have come across before, very interesting! 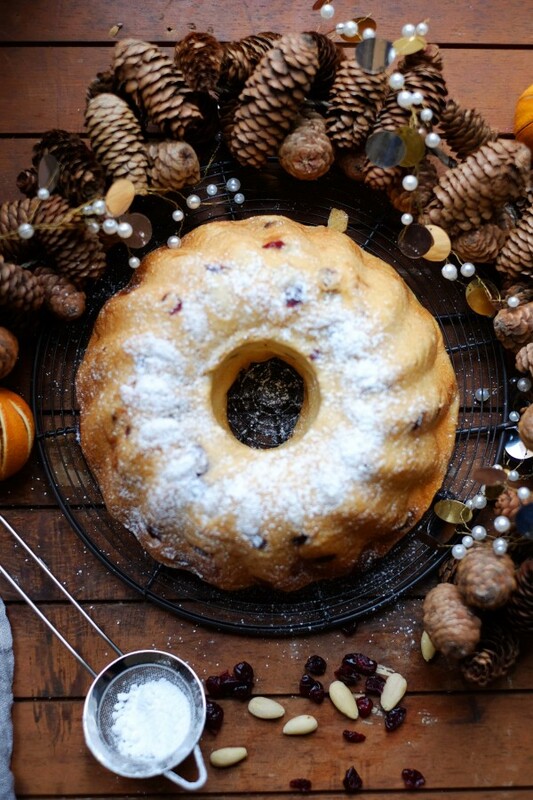 I love kugelhopf – can’t believe it was the first recipe I ever blogged ever. Haven’t made it since but I love sweet breads and this sweet bread/cake hybrid is really just perfect for Christmas. Love the sound of the Valrhona white chocolate – still haven’t found any quality white chocolate that I like to cook with. Valrhona and Amedei white chocolate are the best I’ve used. Pretty easy to melt without burning it and very stable. The taste is great too. This was my first kugelhopf and I really enjoyed it, I’ll definitely make another – chocolate orange would be a great combination. This looks incredible and what lovely photos, Angela! I would absolutely love having a slice or two with my morning coffee! Is it at all similar to a panettone? I can totally relate to feeling of not being prepared for Christmas, thank God for online shopping!! Thanks Julia – I had such fun photographing this one! It’s very similar to a panettone, but a bit more moist, sometimes I find panettone quite dry. Totally agree about online shopping! It’s the only way I get by! I can’t tell you how happy I am to hear that I am not the only one who is way behind on this holiday thing. I have been so busy with life that I barely noticed summer escaped us, Thanksgiving passed and we are now up to our chins in preparing for winter festivities. I can only hope that I somehow manage to catch up. 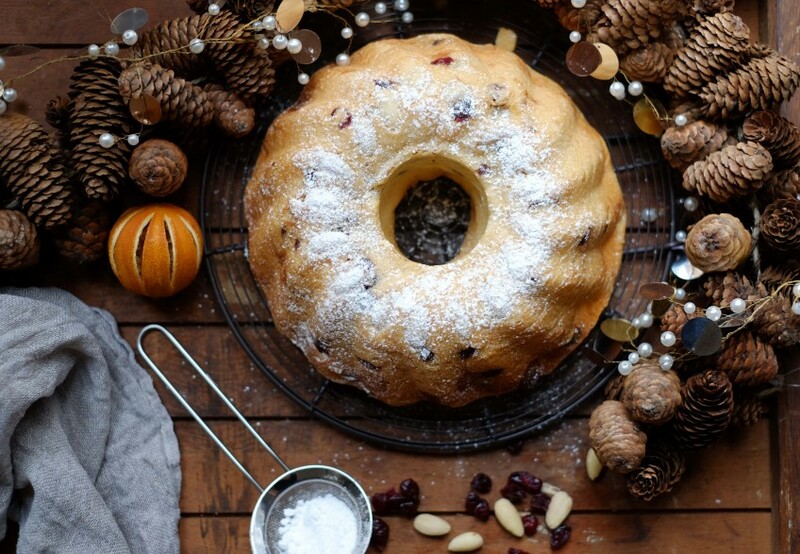 This Kugelhopf is a wonderful way to kick off Christmas baking. It looks so festive and likely got you in Christmas spirit. Hi Lynn, thanks for commenting. I am slowly getting there with Christmas, but I like to try and make the week of Christmas as stress-free as possible, not sure how well I’ll deal with that this year!